‘Highlight the positive and delete the negative’ – Donna Karan. This body shape is slim with small breasts and narrow hips or athletic with a defined toned body and narrow hips. Most clothes look good on this body shape which is why most models fall into this category. This body shape comprises of a large bust with a defined waist and small hips. This shape has the shoulders and bust much wider than the bottom half. The top heavy body shape is sometimes also known as the inverted triangle. The pear shape is defined by a small bust, curvy hips and is usually bottom heavy. The key is to work with the heavier bottom half to achieve an all over balanced look by slimming down the hips and bottom area and draw attention to the top half of the body. This shape is naturally curvy with medium to wide shoulders, fuller bust, defined short waist and curvy hips. The hourglass shape is evenly proportioned all over, most plus sized models usually fall into this category. 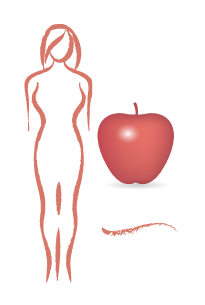 The apple shape usually comprises of small shoulders, big bust and a large tummy area with no waistline, slim legs and arms. This is one of the most challenging body types to dress but also one of the easiest when it comes to disguising problem areas. ‘Accentuate your best features and disguise what you are not so happy with. I am a Pear. What shape are you? What a great post–helpful advice instead of one body type hating all the other ones that aren’t like it as is sadly the custom of the day these days. Making the most of ANY body type is definitely the best approach to bodies and clothing! I am the slim/Slender/Athletic, a woman’s body is beautiful despite her body type it all depends on how you dress it. Wear what suits your body type and u’l come out looking good!!!!! Spot on guys. Every body shape is beautiful. I think am top heavy, hmmm……nice one Stella!